If anyone has ever eaten a Boysenberry pie from the legendary Briermere Farm Stall on the North Fork of Long Island, then you have to taste this wine. We were introduced to this buzzing farm stall this summer, and heard stories of how their pies were of great renown. On our second trip to the North Fork, as we stopped to get our Briermere fix, a bride and groom in full wedding gear jumped out of a black limo and ran up to the stand. They gleefully gasped, “We just got married and are on the way to our reception – but we both decided we had to have their apple pie!” That’s dedication to the pie. Anyways, their boysenberry pie is deliciously dark and rich with the tart, concentrated boysenberry flavor – just like this wine. Parducci winery is in Mendocino, a Californian county with a big reputation for being pot-friendly. It also happens to possess a warm Mediterranean climate perfect for grape growing, which the Parducci family, immigrants from Tuscany, has done since 1921. Today Parducci has expanded immensely, and is run by a larger holding company, yet still turns out some impressive wines. I use the word “yet” because most larger wineries rarely retain the original quality of smaller estates. The vineyards are organic (though not yet certified) and grapes yield full-flavored juice with a warm-climate ripeness. This wine would be great with roast meats, pepperoni pizza, spicy Indian food (lamb tikka masala), sharp aged cheeses and with, of course, Briermere Farms Boysenberry Pie. Shiraz and Syrah are the same grape. It has its origins in the Rhone region of France, where it is known as Syrah. Australia, where it’s called Shiraz, is covered with the vines (40% of all vines), and because there huge production Shiraz is most commonly associated with the country. Petite Syrah is a different grape entirely though. It is an offspring off Syrah, but was made by crossing the Syrah grape with a grape called Peloursin. This happened at the end of the 19th century in France. You’ll unlikely ever see the word Peloursin again, but remember that Petitie Sirah is not the same as Syrah/Shiraz. Australia, the darling of today’s wine world, has pushed its way to the forefront through consumer-friendly wines and consistent marketing presence. The country has a wine history dating back about as far as the US, with first vines being planted in the late 18th century - relatively recent in terms of the wine world. Thus Australia has always been eponymous with New World wines, the general reference to wines crafted in a riper, softer style with more lush fruits. Yalumba is the oldest family-owned estate in Oz, dating back over 150 years. They do almost everything on their various properties, including their own cooperage (making the barrels). This wine is from their estate in Barossa, a warmer region near Adelaide (near the centre of the country, all the way south) that is mostly synonymous with bold, ripe Shiraz. However, Yalumba owns some great 70 year old, low-yield Grenache vines that make the grapes for this wine. Winemakers love old vines: since the older the vine, the deeper it’s roots and the lower it’s yield of grapes. The result is a smaller, more concentrated and flavorful grape and thus wine. 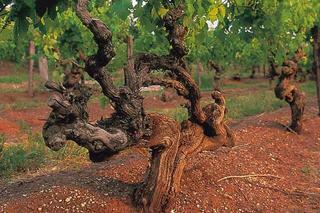 Pic: A gnarly, 70-year old vine at Yalumba estate, Barossa, Australia. Because of the dark, delicious bittersweet chocolate and plum flavors, this wine is a great cold weather wine. Stick it in the fridge for five to ten minutes to get it just below room temperature, and it’ll be a wonderful accompaniment to Steak Mole, spicy BBQ chicken, Chinatown-style ribs or even with a dense Chocolate cake.